Our redesigned line of shears the MS series Power Operated Shear may give you just the edge you were looking for. These high performance motor-driven shears utilize direct drive inverter controlled technology which provides efficient operations. Rapid cutting of the piece part is realized without sacrificing the cutting quality. This modestly priced series plate shear is a productive solution for serial production parts. The MS series is equipped with table top ball transfers in the table, this assists in feeding the sheet as well as reducing marking on sensitive materials. Sheet hold downs are a simple spring style hold down system which securely holds the material in place during the shearing process. 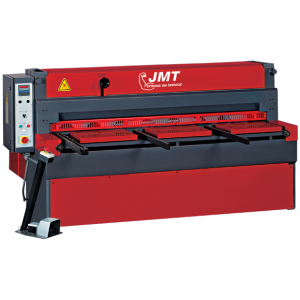 As you look more closely at our offering of high quality plate shearing machines we think you will agree, JMT has the plate shear that can “cut the mustard” in your shop. Please give us an opportunity to show you who JMT is, and how we can help your bottom line by improving your production. Combine those advantages with our industry renowned service, our well-staffed emergency service line, and a parts department that will have what you need when you need it. If your initial investment includes tooling up your plate shear, JMT has you covered there as well. The MS series brings its powerful, motorized action to your light to moderate cutting projects with the ability to manage extra sensitive sheet metal to dense plastics. Precise handling of ultra-thin sheets is backed by a specialized t-slotted support system with ball transfers in the table for reduced marking on materials. There is also the advantage of sheet hold downs, a spring style that clamps materials securely in place with a non-slip rubber pad.